Tag Archive | "Setting up your first tropical fish aquarium"
Pros And Cons – Freshwater Or Saltwater Aquarium? 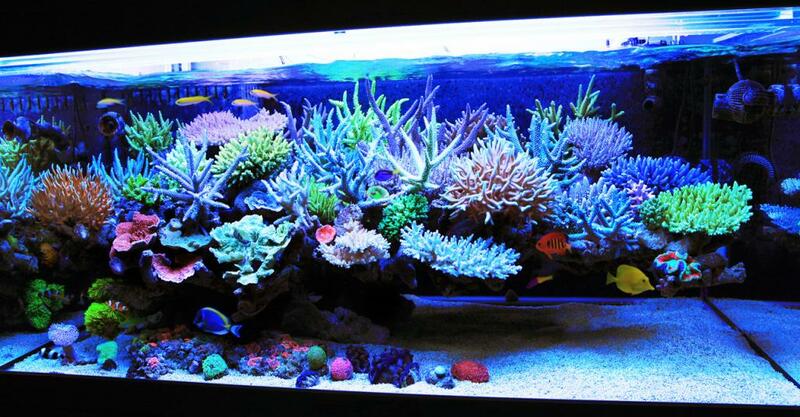 What are the pros and cons of keeping a freshwater or saltwater aquarium? Tropical fish keeping can be divided into two primary categories. Maintaining the care of freshwater fish or caring for their saltwater counterparts. Both types of tropical fish keeping will provide you with a great deal of enjoyment and add some living color to your home. Children and adults have been bringing home fish and other creatures from their local waters since the beginning of time. It could be crayfish, minnows or baby bluegill from a stream or a small octopus or Blenny from a saltwater pool at low tide. Regardless of what you bring home, you will need to take care of it, or eat it. Assuming that you don’t want to eat your catch, your next step is to decide how to keep it alive. Aquariums fit the bill nicely and can be set up for either freshwater fish or saltwater specimens. Freshwater tropical fish are beautiful to look at and many species are adorned with unique color patterns akin to their more colorful saltwater cousins. Some are more exotic looking than others but if you have never dealt with freshwater tropical fish before, you will be mesmerized by them. Each species of fish may have have different requirements for their living conditions but many species can be housed together in a “community tank” setting and peacefully coexist with each other. Beginning tropical fish keepers usually start with freshwater aquariums because they are easier to take care of and are more “forgiving” if you make a mistake. De-chlorinated tap water can be used to fill your tank and make periodic water changes, and test kits are readily available to ensure that everything is in order. Fish that thrive in freshwater are not necessarily too particular about where they swim. Most will thrive in a neutral pH water environment however the water temperature IS important. As their name implies, tropical fish like to have their water a bit warm. You can monitor and adjust this with a good heater placed in the tank. The emphasis is on GOOD one. A cheap heater could cause you to lose all your fish. 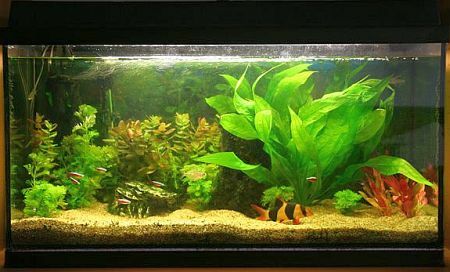 Freshwater aquarium setups are normally less expensive than the saltwater variety. The cost of the tank and stand is usually the same but the lighting, filters, protien skimmers, etc.can set you back a bit. You can get a 30 Gallon acrylic show aquarium combo these days for around $225.00. This may sound expensive but it will save you money because you won’t have to spend more on additional equipment. Freshwater tropical fish are also less expensive than saltwater fish unless you get into the really exotic species like Discus, Arrowanna, freshwater rays, etc. Saltwater aquariums are awesome in their beauty and will give and your friends hours of viewing pleasure, but they do require more work. This is why most beginning tropical fish keepers choose a freshwater aquarium to start with. However, if you are a dedicated person willing to learn everything necessary to keep a saltwater aquarium running smoothly, saltwater fish keeping may be for you. Saltwater tropical fish are a little more delicate than the freshwater fish you may be used to keeping. Setting up their environment correctly is critical to their survival and well being, at least in the beginning. Once they settle into their tank environment, their activities becomes what you would expect to see in a small part of the ocean. Everything revolves around keeping the water salinity correct. When keeping saltwater aquariums, monitoring of salt levels is crucial. Too much or too little salt will kill your fish and because saltwater tropical fish cost substantially more than freshwater tropicals, you will probably want to keep your fish alive as long as humanly possible. Maintaining marine tropicals costs more than it does to maintain freshwater species, but do you know why? Unless you live on the coast where you can easily collect fresh seawater to conduct periodic water changes, you will have to mix your own “sea water” using synthetic sea salt mixtures. Commercial sea salt for the aquarium trade has come down in price but is still expensive. In addition, protein skimmers are needed to keep pollutant buildups out of your tank water and special lighting is needed if you choose to keep corals alive and healthy. These can initially be quite expensive however, if you don’t mind paying a bit extra and you have the dedication necessary to maintain a saltwater tank, you can literally move a part of the ocean into your home. Once you decide to take on the responsibility of tropical fish keeping, your next decision is whether to invest in a freshwater or saltwater tank. Hopefully, the above information will help you make your decision. Tropical fish keeping is an enjoyable, relaxing hobby, but setting up your first tropical fish aquarium for the first time can be a daunting experience if you have never done it before. Before you even think about bringing your first fish home, they must have a place to stay. Since the aquarium will now be their new official residence, it should ideally have as many of the amenities of their previous digs as possible. The first step is to purchase a suitable aquarium for the fish you intend to keep. Ideally, you need to purchase the largest aquarium that you can afford. A twenty or thirty gallon tank may seem large for one small fish, but in time the fish will grow and so will the other fish that you will inevitably add to the tank. Size does matter! Fish need plenty of room to swim around in both to reduce stress and to provide them with as much oxygen as possible to their gills. The more fish you add to your tank, regardless of the size of the tank, the less oxygen the fish will be able to absorb. Therefore take some time to plan ahead on what type fish you will be keeping and size the tank. After you purchase a suitable tank, think about where you want to showcase your fish. Positioning your aquarium is important for several reasons.  Placing your tank close to a window is a bad idea. Sunlight can heat up your tank and cause the water temperatures to rise beyond what the fish can tolerate and you could find your tropical fish going belly up. Conversely, situating the tank near an air conditioner or directly under a ceiling fan can have the opposite effect and keep the tank water too cool for tropical fish. In most areas of the country you will need a heater to keep the tank water at a comfortable temperature for your fish, so be sure there is an outlet nearby for plugging in your heater, running your filters and your tank lights. Another consideration most people overlook is the weight of the tank when filled with water. One gallon of water weighs approximately 8.35 pounds which makes a 55 gallon tank setup with gravel, scenery, filter, hood, stand, etc. weigh in at a minimum of 460 pounds. Make sure your tank is placed in an area that can support the weight when fully set up. Your next step in setting up your first tropical fish aquarium is to add a suitable substrate over your under gravel filter along with rocks, caves, fake or real plants, etc. for the fish to enjoy. If you are going to use an under-gravel filtration system, you need to cover it with at least an inch of gravel to provide for adequate filtration and slope it towards the front of the tank. The sloping is done to aid in siphoning out fish waste and other nasty stuff from the bottom of the tank after it has cycled. If you use not using an under-gravel filtration system, be sure to purchase either a good canister filter or an outside filter that requires at least two filter cartridges. This minimizes the disruption of the naturally growing beneficial bacteria when your need to replace a dirty cartridge. The idea is to replace one filter cartridge at a time at different intervals so you do not disrupt the nitrogen cycle. Your next step is to slowly fill your tank with de-chlorinated tap water. Tap water is convenient for filling freshwater aquariums but municipal water generally has high levels of chlorine, nitrites and nitrates in it which will kill tropical fish. Additionally, depending on the area that you live in, your tap water may be excessively soft or hard. Use one of the many available chlorine removal products, along with an approved test kit to check your water hardness before adding any fish to your tank and adjust your pH accordingly. Add water to your tank slowly so you don’t disrupt the gravel, plants or other scenery. Placing a small plate on the bottom of the tank and running your water on it will minimize cloudiness. After your tank is filled, don’t bother re-testing the water until you add fish to the tank.  Pet stores stock test kits which you can purchase that test a variety of chemical levels in your tropical fish tank. Excessive amounts of ammonia, nitrates and nitrites will kill your fish and should be carefully monitored after fish have been added to the tank. Test the water regularly to make sure that these levels stay within normal limits as your tank goes through its nitrogen cycle. The filtration system and beneficial bacteria that grow inside your tank environment will gradually rid the tank water of excess ammonia, nitrites and nitrates. Keep a keen eye on these levels for the first few weeks before and after your tank cycles out. Accessories and additional fish can be gradually added after your tank completes it’s nitrogen cycle. Add only one or two fish at a time to prevent ammonia spikes. Most fish love to hide in rocks or coral caves and swim through dense live or artificial plants, so it’s generally a good idea to make your tank look as much as possible like their natural surroundings. An aquarium planted with live foliage along with an anchored wooden log will keep most South American fish healthy and happy and maintain the correct pH of the water. 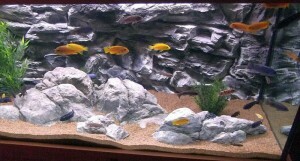 An aquarium set up with plenty of open rock structure and makeshift caves will keep African cichlids healthy and happy. Want to know more about setting up your first tropical fish aquarium? Look for additional posts on this site or visit your local bookstore to check out the numerous magazines and manuals written on how to care for your tropical fish .